When my eldest child was a baby, my mum came to stay because I was unwell. One afternoon she popped into my bedroom to bring my son for a feed and cheerfully told me she washed my nappies for me. However, she said, that the wash hadn’t got the green out of the nappies that had gone a green colour, so she’d put them on to soak in Milton. I was horrified! For a start, my nappies were supposed to be green, I’d bought beautiful mint green fitteds from a WAHM, and secondly, bleach isn’t good for nappy elastics. My mum had been used to soaking terry squares in napisan, boiling them if they were still stained and hot washing, but she didn’t understand modern cloth nappies. A few washes after the soaking incident and my beautiful, (no longer) mint green, hand made fitteds fell to pieces at the legs where the elastic perished. Recently, a group on social media has been advocating that people wash their nappies in toilet bleach. Yikes! Washing nappies in toilet bleach is not recommended for a number of reasons. Firstly, toilet bleach is not skin-safe. It’s covered in warnings about not letting it come into contact with your skin. Do you really want something washed in toilet bleach next to your child’s most sensitive areas? Secondly, it’s not fabric safe. It will almost certainly take the colour out of most fabrics (even milton left a purple t-shirt horribly spotted when I was spot treating mildew and spilled a highly diluted form recently). It will also rot delicate fabrics like elastic. Finally, it will invalidate your warranty on most cloth nappy products. So what do you do if you need to get your nappies really clean? It partly depends why you need to do it in the first place. A good wash routine will prevent most unpleasant smells, Go Real has the guidelines for good washing here . 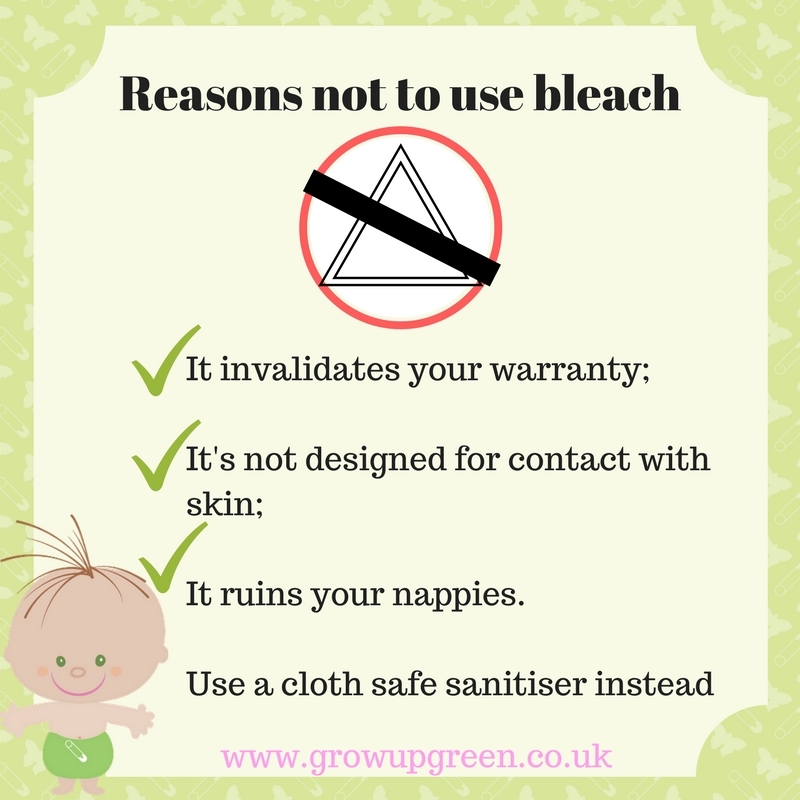 If you buy second hand nappies that are stained or smelly, then that link has some suggestions for strip washing, or these tips here could help. I’m a huge fan of a 60 degree wash with a full does of washing powder and scoop of Little Violets stain remover. General stain removing is best achieved with sunlight. So please, when you are going to wash your nappies, think twice before using toilet bleach!